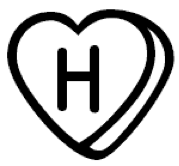 For her “D” post last Friday, Rara posted her delicate dinosaur dream…for her 30th birthday, 140 days from now, she would like to have assembled a collection of images, taken around the world, that proclaim #rawrLove. Shoot, I thought. That’s simple enough! No reason I can’t help her dream come true. I wanted an image that was unmistakably Fredericksburg. There’s a pretty cool Welcome to Fredericksburg sign in town, but as I was out and about during the evening rush hour and it is not in a location conducive to stopping for a photo, I needed a back-up plan. I could have gone to a Civil War battlefield…Fredericksburg runneth over with them, but I’m not sure that particular setting would be in keeping with #rawrLove. So I opted for our famous ice cream/custard stand, Carl’s. Opened in 1947, Carl’s has been tempting residents and visitors with its three flavors (chocolate, vanilla, and strawberry) for nearly seven decades. It is most definitely an iconic landmark around these parts, with lines in the summertime stretching completely around the perimeter of the building. Featured regularly in national publications and spotlighted on several TV shows, Carl’s was added to the National Register of Historic Places in 2005, and has a loyal following of out-of-towners as well. 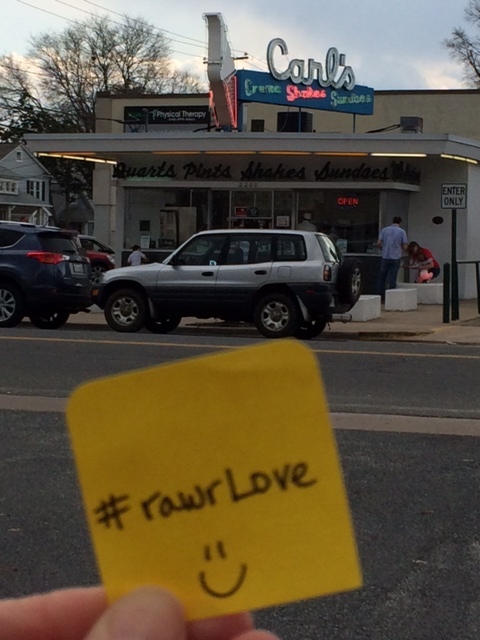 Everybody loves ice cream, so I thought it’d be the perfect local spot to catch some #rawrLove! So, Rara, I’ll be emailing Grayson Queen some #rawrLove as requested, and I hope you have a fabulous birthday in 140 days! Well, April’s gone and done it again. This time with a mass stabbing at a school outside of Pittsburgh. I’m trying really hard to dwell on the darkness. I hate April, I hate April. There, I’ve said it. Moving on.